Pu'u `Ohikilolo has been on my bucket list for the longest. Back in January of 2010, I have made an attempt to reach the summit via the entire length of `Ohikilolo Ridge but with no success due to time constraints and a socked in summit. Up until this day, Pu'u `Ohikilolo has remained a dormant peak, tucked away in the vastness of my mind. On January 26, 2011, a little over a year later, I returned back to `Ohikilolo Ridge to finish off what I've started... to summit Pu'u `Ohikilolo. However, I would use a different route which I've acquired from a recent trek by August Smith, Duc Ong, Kevin English, and Nate Yuen. 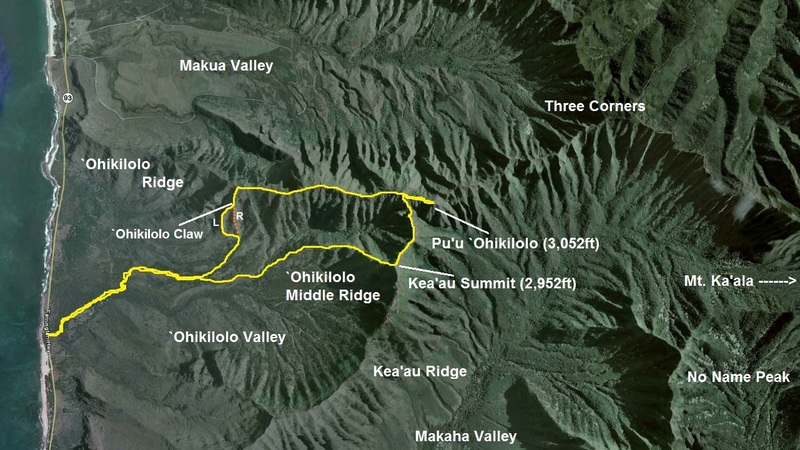 They've gained the crest of `Ohikilolo Ridge by a way of a spur that resembles Bear Claw geographically. 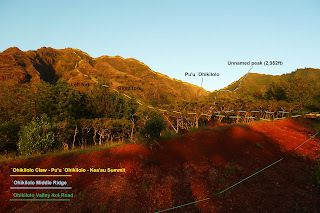 With this knowledge, I've planned a route that would ascend "`Ohikilolo Claw". Once at the crest we were to continue towards Pu'u `Ohikilolo (3,052ft) and then cross over to the Kea'au summit (2,952ft) via a connector ridge. Finally, we would drop back down to the floor of `Ohikilolo Valley and ultimately back to the starting point of our loop trail. On a map, this loop takes on more or less, the shape of a rectangle. Thus, I decided to coin it "`Ohikilolo Rectangle". The crew for this day consisted of Marcus Griego, Eddie Pieters, and myself. Weather conditions were picture perfect, party cloudy skies with gentle trades. As we made our way down the 4x4 jeep road at around 7:30am, I looked at my GPS to see where we would veer left off the road. From the topo maps I've looked at, those guys took a route that went along a small ravine. We took said route and off we went in the general direction towards the claw. Unfortunately, there was no trail at all whatsoever and we eventually decided to just make a beeline towards our target ridge through a forest of small trees. 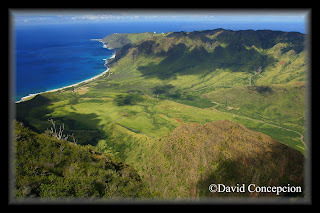 Soon, we began to hear cows off in the distance and I thought about Mr. Silva and the Makua/`Ohikilolo Ranch. Apparently he has had problems with trespassing hikers in the past, mistaking them for poachers. I was pretty sure that we were trespassing directly on the property. We eventually came upon a fence and hopped over it, the ridge getting ever so closer. After plowing through tall grass for what seemed like an eternity, we dropped back down to a small gulch and picked up the ridge on the other side. Checking the GPS again, we were now on our target ridge, the right fork, and it clearly showed. Up was the dominant factor for the next hour or so. After we gained some elevation, we were able to make out the "left fork" that was labeled on the topo map. Since those guys went up the right fork, we decided to contour on over to the left fork and climb up that instead. The grade was steep, but not dangerously steep, unlike Bear Claw. Any rock faces we climbed were very minor and if we did encounter a fearsome looking one, it was easily contoured. The ridge never narrows to mind boggling proportions except maybe for one small spot, but not even that was a big deal. In fact, the ridge was quite broad for much of the way up. Marcus and Eddie checked out a massive gully that was off to the left of the left fork and even spotted two goats treading about on the next ridge over. I wonder how these goats can survive in such harsh conditions with hardly any water. There was one particular rock formation that we stumbled upon just after the junction of right fork and it was quite funny because the shape of the rock was like if the ridge was giving us the birdie. I decided to name this "Middle Finger Rock". Marcus thought it was shaped more like a dinosaur head. No Marc, this ain't no Jurassic Park! You can find that over in Ka'a'awa Valley! Much of the climb was uneventful and we soon reached the crest and the oh so annoying fence! I thought I'd never see YOU again! On the other side of the fence was Makua Valley. The balance of sun and clouds couldn't be any better as the shadows of the clouds dotted the expansive landscape of the valley below. "Click! ", said my camera! 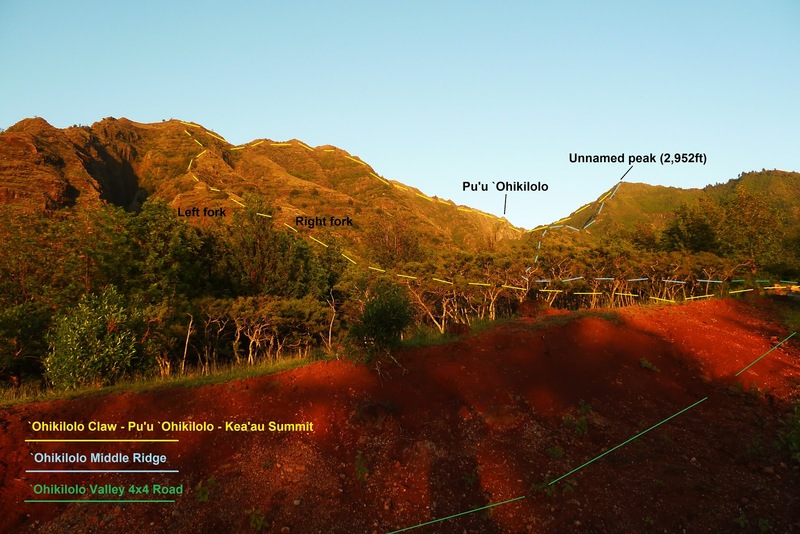 We headed mauka (inward) towards Pu'u `Ohikilolo along the crest and fenceline. While the fence was an eye sore for views and getting in the way for much of the journey, it proved useful in some of the eroded sections where it provided a security handhold. We soon came to a flat grassy area and the pyramidal shape of Pu'u `Ohikilolo beckoned a short distance ahead. We also got our first views of the North Shore. A short distance later we came upon what appeared to be some kind of camp site used by the military. An even more surprising object caught our eyes and upon closer inspection, revealed it to be a toilet! 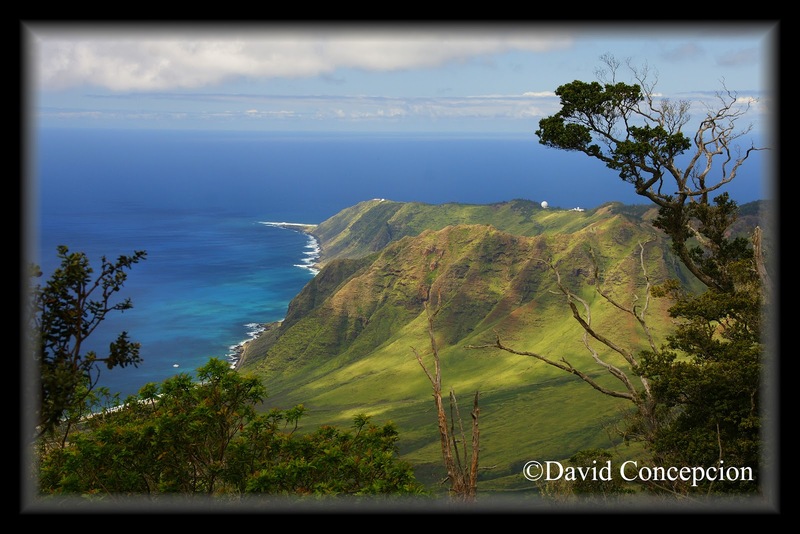 There was a wall erected on the makai side of the toilet for privacy but over to the mauka side was a grand view of Makua Valley! We peered inside the toilet, expecting a foul oder scent. But much to our surprise, it was actually very clean and the hole that was apparently dug or drilled into the ridge seemed like it went down for quite a way as we didn't see anything but a black abyss. Well folks, this is probably the only trail you will find a toilet that is perched nearly 3,000ft up in the mountains that has a magnificent view while you do your business! I decided to call this "`Ohikilolo Toilet". Just beyond the toilet is a very eroded section. This eroded section marks the start of the connector ridge over to the Kea'au summit, which seemed so close, yet so far. Ahead was our final climb to Pu'u `Ohikilolo and it wasn't long before we were standing on top of the world.... literally. The views from up here is one of the best on the island and probably the best out of all the Wai'anae Range views, even rivaling the views from Three Corners. You can literally stand on the summit and spin yourself and watch the amazing views whirl about into a blur! The valleys of `Ohikilolo, Makua, and Makaha Valley can be seen simultaneously, similiar to Three Corners. Reluctant to leave our throne, we made our way back down at around 1:30pm where we came from back to the eroded section to begin our cross over to Kea'au summit. I walked along a narrow dike with a massive drop to Makaha Valley on my left and a more reasonable drop to my right. Suddenly, the ground fell from underneath me and I found myself in a very brief free fall. With "quick cat like reflexes", I threw all my weight forward onto the next good sized rock and looked back to see rocks falling down on the right side. This reminded me of Mario Bros where you hop on these platforms suspended in mid air, only for these platforms to start falling and you must continue to advance forward to prevent falling down with them. I've just experienced my first real life version! Keeping a cool head, we dropped down briefly to a very eroded area with towering and menacing looking rock formations overhead that looked like giant teeth. We read in articles that there's a goat trail that contours the Makaha side of this rock formation. We didn't find it (we didn't drop down far enough to pick up a trail), so we opted to climb over the "Teeth". Once on the crest of the teeth, we could see the rest of the jagged like dike. 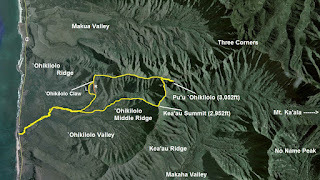 We either climbed up and over or contoured on the `Ohikilolo Valley side of them. Any fall here would be fatal and our lives depended on the structural integrity of these towering but extremely narrow rocks. If any of these rocks gave way, it's over. At around 3:30pm or so we topped out at Kea'au summit and took in the views of Makaha Valley. Since I've done the `Ohikilolo Middle Ridge prior to this hike, I was back on familiar territory. I led our group back down, across the narrow dike, and back to the 4x4 jeep road. It was around 6pm when we got back to the car, thankfully still intact despite leaving it on the side of Farrington Hwy for the whole day! Predicting weather in Hawai'i is like trying to predict that your next reel on a slot machine is going to land on 7,7,7. The weather here is simply too unpredictable. This proved true on the day of this particular hike. The night before, they were forecasting gloomy weather, rain, and the like from a powerful storm near the islands. This storm was also producing an extra large swell and they were going to see if Waimea Bay would call the day for "The Eddie" or the 2011 Quiksilver - In Memory of Eddie Aikau. Unfortunately, it was a no go on Thursday (1-20-2011). The following morning I woke up, expecting gloomy weather, but to my surprise after looking out the window, there was not a single cloud in the sky and the contrast of the Ko'olau popped out like I could reach out and touch them. Ahh, too bad there wasn't any hike scheduled for this picture perfect, vog free, day! While sitting around at the house, I received a message from Albert at around 12:30pm and asked if I wanted to hike Kea'au Ridge. I asked him that if it was kinda late to do such a hike. Apparently today was the last day of his vacation and I guess the picture perfect day was just beckoning him to go on a hike, even if it was last minute and late in the day. Since I haven't done Kea'au Ridge, nor have hiked with Albie before, I agreed without hesitation but made sure to bring the flashlight as I was pretty sure that we would be out after dark. After Albert picked me up in Ewa, we parked at the beginning point of Kea'au Homesteads Rd, which snakes it's way into the heart of 'Ohikilolo Valley. 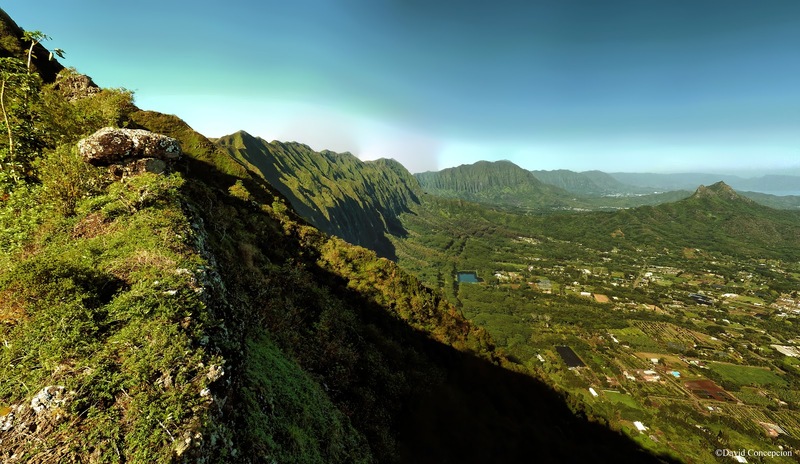 This valley is situated between the larger valleys of Makua and Makaha. I've heard that this area was closed to the public but as with any other closed trail, we ventured in anyway. Since we couldn't drive inside (gated), we opted to walk the entire length of the road and boy what a walk it would be! The road started out paved for about an 1/8th of a mile then became a 4x4 road with a stream crossing (stream was dry). To our left was 'Ohikilolo Ridge, which I've hiked back in early 2010. To our right was the actual Kea'au Ridge that starts behind Makaha Towers. Dead ahead was the menacing peak that marked the summit of Kea'au Ridge, our destination. Slightly to the left of that peak was Pu'u 'Ohikilolo, the pointed pyramidal peak that marks the terminus of 'Ohikilolo Ridge. After about a 45 minute sweat inducing walk on the old 4x4 road, we could make out the middle ridge that heads up to the massive peak. In relation to the road, this ridge was slightly to the left and we noticed a trail just across an old abandoned tanker storage that branched off the road on the left and appeared to make a beeline for said ridge. We decided to take the trail and it eventually got overgrown to a point that we thought we were on the wrong trail. Up ahead was a gully with a flowing stream and behind that was our target ridge. We crossed the stream at some point and eventually found our first ribbon and the trail was more discernable. The climb up middle ridge was brutal and I fell behind as Albert made it look like a cake walk. Unfortunately, all that walking on the road under the sun at a gradual incline zapped all my energy away. But my motto is slowly but surely. Once I gained the top of the ridge, the trail narrowed and the trees gave way to some pretty big drops on both sides. Up ahead, I could see Albert scoping out his surroundings. He called out to me, saying there was a dike formation up ahead. My excitement finally started to build in me as I caught up to him. 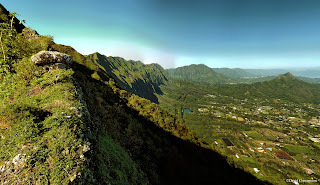 Beyond the dikes was the final assault to the summit of Kea'au Ridge. We even saw some good sized rock faces that looked pretty darn mental, but looks can be deceiving and we wouldn't know what we were in for until we got there. Going over the dikes was no problem for us and I couldn't help but admire the views of the fluted cliffs of 'Ohikilolo Ridge. The now low sun created a cool shadow effect on each of the gullies, a photographer's delight! We soon began our final climb with the aid of some ropes in the worst parts. We discovered that the trail actually contours around all the big rock faces and the climb was not bad at all. At around 4:30pm we reached the summit and just with any view from the Wai'anae Range, it was spectacular! Albert pointed out the connector between Kawiwi and No Name Peak just beyond the Kamaile'unu Ridge. I pointed out Three Corners, a hike I did last April and the last hike on the Wai'anaes prior to today. Dead ahead was massive 4,025ft Mt. Ka'ala and following off to the right along the summit crest, Kalena, Hapapa, Kanehoa, and Kaua. Directly to our left was the connector ridge leading up to 'Ohikilolo Ridge which from there you could turn right to easily reach Pu'u 'Ohikilolo. After about a 30 minute or so break on the summit, we double timed it on our descent, for as the sun was quickly setting. We followed the ribbons this time all the way back to the road and it turns out that we missed the trailhead by maybe only 50 yards! We were on the road by around 6pm, just as the last daylight disappeared. My flashlight would come in handy after all as we needed until 7pm to get back to Albert's car. I have to say this was a well executed hike despite being a spur of the moment kine! It was definitely much shorter than I have expected. With Makapu'u to Mariner's Ridge being the first hike of the year, it only made sense to do the 1st "mental" hike of the year and since I haven't done the right fork yet, this was the perfect choice. Even prior to Makapu'u - Mariner's, I've had right fork in my sights as far back as December of 2010. However what makes right fork so difficult to get to is the fact that one has to do all sorts of "T-things" just to get to it. Unlike left fork, which one can slip through some fields to reach the water tank, right fork is virtually sealed by all sorts of property like a wall with no easy way in. I had help from directions which I've acquired from a member of the HTMC. So with these directions in hand, I thought to myself that it would be EZ PZ to get to right fork. Originally the plan was to go on the 12th (Wednesday), but heavy rain was forecasted, along with a flash flood watch, starting Wednesday and lasting up to the weekend so I decided to move it up one day to Tuesday, the calm before the storm and what a picture perfect day to do it. There was virtually not a single cloud over the entire island this day so it was perfect to hike just about anywhere. The crew for today would be Randy, Michael, Howard, and myself. Randy and Howard have each done Left Fork and also True Manamana while this would be Michael's first "off the beaten path" hike. We all met up at the Kuli'ou'ou Trailhead and staged cars there. After we reached the same area in Waimanalo and parked at the same spot, we headed right along a road. When we got to a long driveway, the first thing that struck me the most was the amount of rooster crowing. There had to be at least over 100 roosters for all of the crowing that was happening simultaneously morphed into one continuous sound, akin to the annoying vuvuzela sound that was heard at the 2010 World Cup. We tried to look for key landmarks that were mentioned in the directions given to me but alas we couldn't find anything that matched the descriptions. However on the GPS, our location was pretty close to the start of the right fork. However we couldn't find a way to advance forward, that is until we saw a fenced gate that we could perhaps hop over. Beyond the fence was some kind of dirt road or trail that headed in the direction that we wanted to progress. As we were about to hop the fence, Michael discovered that the gate was only locked by a few metal wires that was merely twisted. With a simple twist, we opened the gate and slipped into what appeared to be a chicken farm. After closing the gate and twisting the wires back into it's "locked" position, we continued on the old 4x4 road when suddenly some dogs began barking furiously at us. We actually didn't see the dogs but they were close. Afraid that the owner/s have been alarmed of a comotion, we veered off to the right into some tall grass, away from the area where the chicken coops were at. We decided to continue our forward progress by climbing through the foliage. A short distance later, the vegetation opened up and much to our dismay, we were standing in a field full of trees that were in numerous rows. At this point, our adrenaline skyrocketed and we made a mad dash across this field into another embankment that went up into the woods. Back in our comfort zone, Randy took the ramrod and we continued on in the forest, but this time the forest was here to stay and the vegetation started getting thick. I checked my GPS again and noticed that we had veered off to the right of right fork. Heading back to the left, we plowed through the tall grass and came upon a powerline. I recognized this powerline as it was the same set of powerlines that cuts a large swath through the base of the Ko'olaus, intersecting both left and right forks. We were close! We continued our gradual shift to the left, but at the same time, we climbed upward. I could tell we were making progress because the sound of the roosters was now behind us. About maybe 100ft up, we came across a trail. Thinking that this was the established right fork trail, we scouted both ways, but both headed back down. Disappointed, but not discouraged, we continued our upward climb and soon another trail came into view, but this trail was very wide. Randy scouted the trail ahead and soon discovered that we were at the crest of the ridge with the ridge sloping downward on both sides. At last, we found the trail and we resumed our climb on a discernable trail. After a short while, we got our first view and we were amazed on how much elevation we have gained just trying to find the trail. Up ahead was our first set of rock faces. However unlike left fork, whos rock faces were rather short in continuity, these rock faces kept going up and maintained it's near vertical grade for quite a long time. One has to be wary of the hiker in front of him because the rocks easily crumbled with each step, sending pieces to the hiker below. Up, up, up we went and finally did we get over them and we were treated to another view. Over to our left, we could make out left fork and it's water tank below. There was one thing that right forked lacked that left fork was full of, those Koa trees! Right fork was relatively more open and exposed and we did not have to fight those low growing trees that much, albeit some small areas, especially near where left and right fork meet. We came across the next rockface to be climbed and this one was the scary one for this day. One was required to slab over to the left to a small protrusion, but with a mighty step just to get to it. From here you could either utilize the old cable on the right and heave your way up the steep and smooth rock. Or you could head left and grab hold to some sturdy tree branches to bypass the smooth section of the rockface. Foot placement is critical here. There were probably only three good footholds, all requiring stretching your legs far to get to each of them while the rest is upperbody strength. Randy was the first to get to the top and secured a rope to supplement the old cable. Next was Howard, than me, and finally Michael. We all made it over without incident. After a few more climbs up smaller rockfaces, the Koa trees returned in full force. I looked over to my left and I could see left fork was extremely close so I knew that this area of trees was a signal that the junction was very near. Sure enough, we spotted the same two ribbons that we spotted from left fork and a short while later, came to the Ironwood tree that is a little past a small clearing just after the junction. We were back in familiar territory and I began to feel more comfortable with the climb. Randy and Howard decided to keep climbing while Michael and I opted to take a short break here. About 5 minutes later, the two of us saddled up and continued our trek through a narrow dike formation with "Mario Mushroom", a rock outcrop that is shaped like a mushroom from Mario Bros. Further up we climbed smaller rock faces and reached a small level section. From here we could see that Randy and Howard were already booking it and were already nearing the final climb to Pu'u O Kona. Another 30 minutes passed and we saw that they were on the final climb and then the summit! Michael and I soon reached the "True Manamana" section, a narrow ridgeline that is completely overgrown by scratch brushes and small trees and we were soon on the final ascent. Since I had no shovel with me this time, I decided to use a screwdriver for leverage. The ascent was much easier the 2nd time around and soon enough, we rejoined Randy and Howard at the summit! The time was around 11am. After a short break, we crossed on over to the Kuli'ou'ou State Freeway Trail and descended the anticlimatic switchbacks and we were at our cars at around noon. We all proceeded to Keneke's for our post hike refreshments and soon retrieved Randy's car at the Bear Claw starting point. We all agreed that right fork was more difficult than left fork and slightly steeper. We also agreed that looking at Bear Claw from Waimanalo side has a resemblance of a T-Rex claw. However, there's a point in the climb, about halfway between left/right junction and the summit, that if you look back down, the ridge actually really does take on an appearance of a bear claw! Jeremy Kreis and I had a discussion one night on Facebook that the people who named it Bear Claw must have named it from a top down perspective!